Const. Barnie Nicholson stands by car that was in an accident before warning about careless driving and drunk driving. Const. Bill Fedoruk on police switchboard over New Year's Eve. Const. 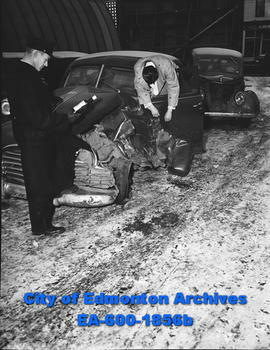 Lloyd Monson inspects accident vehicles. Constable Bill Fedoruk, city policeman and winner of the crossed silver revolvers badge for scoring above 90% in target shoots. Constable Dave Burns inspects twisted remains of car crash. Constable Donald "Doc" McNaughton in bandages. 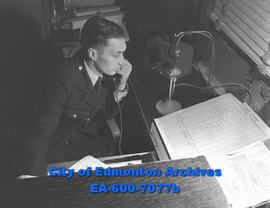 Constable H. I. Moore, Edmonton City Police, following armed holdup.